Have you ever looked at a lovely craft and then wished it was simple enough for your three year old too? Well, we know exactly how you feel! While some crafts can be simplified for the younger age group, it always works better when there are activities specifically designed for them. They’re very important members of the crafting community too! So once you’ve introduced your little one to the basics of crafting, it’s time to dive into our ultimate list of crafts and activities for toddlers and preschoolers! 1. This colorful Hand Print Flower Bouquet craft from Glued to My Crafts is so easy to make, your toddler is sure to want to make it again and again! All you need is colored paper, Popsicle sticks and those little hands! 2. This Hand Print Ice Cream Craft is the perfect toddler craft for summer! Crafty Morning shows us how a couple of hand prints and a triangle piece of paper can turn into yummy summer treats! 3. The idea to turn a little footprint into a robin is just genius! Sweet and Simple Things features this Footprint Robin Craft hardly requires anything besides paint! 4. These Foot print Carrots from One Krieger Chick won’t take too long to grow! A great craft idea for spring, Easter or simply to encourage healthy eating! 5. Once you get some hand prints, why not turn them into cute Hand print Chick Puppets? Little kids will have great fun holding on to the sticks and playing around with these puppets! 6. Why stick to just hand prints and foot prints when you can also go for thumbprints? This Thumbprint Corn on the Cob is an easy project for the little ones with just a few supplies. 7. Bugs are common around spring time, and this Hand print Dragon Fly from Raising Little Super Heroes is perfect for the season! The little ones might need some help with the antennae though! 8. We think this Hand print Chicken with Chicks craft is ideal for Mother’s Day! You can even adjust the chicks to how many you have running around your home! 9. Get into the tropical mood with this easy peasy Hand print Pineapple Craft from Glued to My Crafts! Use hand prints for the leafy part and thumbprints to decorate the surface of the pineapple. 10. This Baby Hand Print Octopus Craft from Crafty Morning is adorable! If your child still puts things into her mouth, be careful with the buttons and gooly eyes – and you’ll have a cute craft ready without much effort! 11. Teach kids that there’s more to vegetables than eating them – you can also make art! Try Vegetable Printing – an easy and fun technique perfect for young kids! 12. Art doesn’t get more fun than this! Munchkins and Moms have a great idea for Fly Swatter Painting – dab the swatter in paint and go nuts swatting all over the sheet. 13. Toddlers enjoy scribbling around, but you can turn it into edgy art by using a Tape Resist Painting technique! Get the step by step instructions at Sweet Sand Box. 14. Does your little one love playing with balloons? Well, ow he can make art with them too, thanks to this Balloon Stamping Art from I Heart Arts n Crafts! 15. You wouldn’t consider yarn as a suitable craft material for very young kids, but this Yarn Painting Technique certainly is! You can create all kinds of patterns, and have some lovely multicolored yarn leftover! 16. Ladybugs are always cute, especially when you make them with this Potato Stamping Art from My Mommy Style. Stamp with a potato, then with your fingers and thumbs for one of a kind art! 17. This Shaving Cream Art project from Momtastic is simply gorgeous! We’d recommend the marbling technique for toddlers and preschoolers since it’s easier for them. 18. Young children are drawn to bright colors, which makes this Rainbow Squeegee Process Art perfect for them! Hello, Wonderful has all the details to execute this project. 19. This art project from No Time for Flash Cards looks like so much fun I’d love to try it out myself! It’s a Valentine’s Day craft, but is ideal for any day of the year! 20. This is a great project for siblings, if they agree to work together! Kids Play Box has a great Tulip Fork Painting project that looks real pretty! 21. This Paper Plate Bee looks so cheery and fun, doesn’t it? Non Toy Gifts shows us how to make the perfect toddler craft with basic craft supplies! 22. It’s time to go vroom vroom with these fun Paper Plate Car Crafts from Glued to My Crafts! Make two cars from a single paper plate in different colors! 23. These Paper Plate Flowers from Resourceful Mama are so colorful they’re sure to brighten up your room! They’re ideal for spring, Easter or Mother’s Day. 24. Toddlers are old enough to understand seasons – they know when it gets too hot or cold, or when it rains! This Cloud with Rainbow Craft from Little Hearts Big Love is great for some season study! 25. Even if you aren’t near the beach during summer, you can still have some stuff from the seaside at home! ABC Creative Learning has a cute Paper Plate Crab Craft that’s a (sea) breeze to make! 26. Start kids on healthy eating habits early and life will be easier! Start with a fruit themed craft like this Sponge Painted Apple Craft from Resourceful Mama to get them on the right track! 27. Brighten and lighten up your indoors with a cool-looking Handprint Sun Paper Plate Craft from Family Focus Blog! Don’t forget the sunnies for Mr. Sun! 28. Let your toddler exercise those muscles and improve his fine motor skills with some crafts. We’d suggest this Fine Motor Octopus Craft from Buggy and Buddy for some good practice! 29. Whether your little one has been to the circus or not, she’ll sure love this Paper Plate Clown Craft! All you need are some colorful pom poms and googly eyes to complete his funny face. 30. Let the kids enjoy some juicy watermelon this summer, one that looks real! This Paper Plate Watermelon Craft from ABC Creative Learning is just like the real deal, complete with little black seeds! 31. Hermit the crab needs a home, and you can make it! The Kindergarten Connection has a cute Handprint Hermit Crab, which also uses a sponge painting technique. 32. A chameleon can be any color he likes, and your kid’s Mosaic Chameleon craft can be any color too! No Time for Flash Cards shows you the different ways you can make your own chameleon. 33. We’re sure you and your kids are fans of Dr. Seuss, especially of the adorable elephant Horton! Relive the book by making this Horton Hears a Who craft with toilet paper rolls and craft paper. 34. 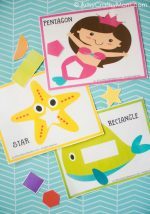 Let’s go colorful under water with a Rainbow Fish Collage Craft! If your child is new to collages, you can tear out the pieces first and then let her stick. 35. Keep your little one as busy as The Very Busy Spider with this Fine Motor Spider Activity from Kidz Activities. Your child might need help with the spider, but let him create the web himself. 36. Make your own spotted animal with this Put Me in the Zoo Craft based on the book! Start out with a yellow paper plate to make the activity even simpler! 37. There can’t be easier puppets to make than these Hand print Fish Puppets from Resourceful Mama! Based on the Seuss Book One Fish Two Fish Red Fish Blue Fish, this craft needs just three craft materials. 38. The Mitten is a lovely book about animals getting together and feeling warm in a mitten. This Pom Pom Mitten Craft from No Time for Flash Cards is the perfect accompaniment for the book and is a different kind of hand print craft! 39. There can’t be anyone who hasn’t read The Hungry Caterpillar, which is why everyone will enjoy this Button Caterpillar Craft. Use a jumbo Popsicle stick and large buttons for little kids. 40. Mo Williams’ books are a favorite in our home – they can be downright hilarious! This Paper Plate Cookie Craft from Glued to My Crafts is perfect for The Duckling gets a Cookie, and is super easy for toddlers and preschoolers to make! 41. You don’t have to wait for Halloween to make this simple-yet-impressive Black Cat Collage from Krokotak! Pre-cut the shapes for toddlers to stick; let the preschoolers try their hand at cutting themselves. 42. With toddlers, going large size always seems to be a safer bet! That’s why this largish Sticky Mural for Toddlers from I Can Teach My Child is bound to be a hit with your kid! 43. Create a beautiful garden in your home with this Colorful Flower Garden Collage from Cutting Tiny Bites! For older kids, try making many mini collages and arrange them together on a large board for an impressive display! 44. Multiple textures always make collages so much more fun! This Bird and Nest Craft from Buggy and Buddy is a great project for beginners – use yarn, feathers, twigs – whatever catches your fancy! 45. This Rainbow Suncatcher Collage from Where Imagination Grows is so pretty, it’s hard to believe even a toddler can make it! Toddlers might mix the colors up a little, but that’s okay! 46. Who doesn’t love gingerbread men? Mom Inspired Life has taken this love to the next level with a super fun Gingerbread Man Decorating Activity that’s perfect for toddlers and preschoolers! 47. If you’ve got a little truck lover at home, then this Build-A-Truck Craft from Little Family Fun is perfect! Gather craft foam shapes in different colors and let the kids create their own kind of truck! 48. This is probably the easiest collage craft to introduce to your little crafter! Nurture Store makes use of foam, felt, card stock, glitter paper and similar textured materials to create this Texture Shape Art Collage. 49. Want to give those fingers a little exercise? Let them make this Tissue Paper Flower Collage from Mess for Less, made by scrunching up colored bits of tissue paper and sticking them all over! 50. This Easter Egg Collage Art is a great open ended activity for toddlers and preschoolers. They can use any color, any material, any shape to create their own custom Easter eggs! 51. These Fall Trees from Crafty Morning are really easy to make – and involved the use of colored popcorn! The corn needs some time to dry, so do communicate this to your crafter in advance! 52. Does your pirate need some company? Then these Crazy Feathered Parrots from Little Page Turners are just what he needs! 53. These Toilet Roll Mummies from Glue Sticks Gum Drops aren’t too hard to make! All you need are paper rolls, black paint, gauze and of course, creepy eyes! 54. A colorful Butterfly Craft is just what you need on a bright spring morning! Check out the instructions at Arty Crafty Kids to learn how you can make this cheery little guy yourself! 55. Let your little monster make some more creatures of his own, like these Toilet Roll Monsters from Our Thrifty Ideas! This is a great fine motor activity, with all the twisting, pushing and curling! 56. Fancy an apple? Why not make your own as shown in Glued To My Crafts? Yes, with a paper roll and cupcake liners, even your toddler can put together a nice little apple on his own! 57. This Paper Roll Bee is such a cute craft from Non Toy Gifts, but requires so little effort! You can also experiment with black tape instead of paint. Don’t forget to draw a cute smile! 58. Give the bee some company with this easy Paper Tube Ladybug Craft from Easy Peasy and Fun! We’d suggest using Googly eyes to make things more interesting! 59. The best thing about making a robot is that you can go crazy with the details! That’s why we think this Paper Roll Robot Craft from Glue Sticks Gum Drops is perfect for young kids! 60. Let your preschooler make her own apple art with some easy Apple Stamps made from paper rolls! Crafty Morning shows us just how easy this project is! 61. There’s something so relaxing about playing with cloud dough, isn’t there? Powerful Mothering has a Cloud Dough Recipe that’s taste safe and in lovely colors! 62. The various textures on this Hot Air Balloon Sensory Craft from Artsy Momma make it not just a visual treat, but a tactile one too! Try as many different materials as you can find to make the most of this project. 63. How would your little one like to paint on ice cubes? Yes, you heard that right! For more details, check out the Ice Cube Painting Activity over at Busy Toddler. 64. Nearly all kids this age love playing with bubbles, which makes Bubble Foam perfect for them! Busy Toddler has the full recipe for this delightful sensory activity! 65. It’s time to hunt for treasure! I Can Teach My Child has such a genius idea for a DIY Treasure Hunt that even older kids will want to get the hands messy as they hunt for gold coins and gems! 66. Most of us have enjoyed playing with kinetic sand, but now you can make your own for your toddler! Surviving at a Teachers Salary has a recipe for DIY Kinetic Sand that’s not just non-toxic; it’s also edible! 67. Have you ever tried Coloring on Sandpaper? Yes, you can almost hear it! 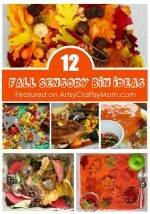 I Can Teach My Child explains how this is an excellent sensory activity for toddlers and preschoolers. 68. With slime, you can be sure that your little one is kept busy for a while! Delicate Construction has a toddler-safe recipe for Rainbow Glitter Slime that looks pretty and is nice and slimy as well! 69. Senses also include smell, and these Montessori-inspired Scent Jars from Mamas Happy Hive are perfect for them! For older kids, use opaque containers and ask them to guess the scent. 70. No more worrying about buildings toppling over, with this Shaving Cream Blocks activity from Busy Toddler! The shaving cream works as a great ‘glue’ and opens up so many play possibilities! 71. This Counting Beads on Pipe Cleaners activity from Laughing Kids Learn is excellent for many reasons. 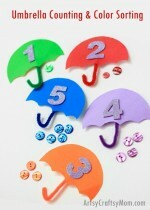 It encourages counting, number recognition, fine motor skills and concentration. 72. Learn about the weather and different seasons with these lovely Weather Sensory Bottles from Two Daloo. Each bottle is simple but very effective to teach young kids about the weather. 73. Let the kids learn about colors by identifying common colors in things around them. Then bring them all to sort on a Color Sorting Train, as shown in Mom Inspired Life! 74. Encouraging your kids to eat healthy is one of our most important responsibilities as a parent. And learning about healthy foods is a great way to start! Check out the Nature Science Activity at Teach Beside Me for more. 75. Many kids learn to spell their name before they even learn all their letters! This Clothespin Name Recognition activity from Munchkins and Moms is perfect for toddlers and preschoolers. 76. This little home of mine has an interesting Fine Motor Alphabet Activity that involves rolling, cutting and shaping play dough in letter shapes. This works great for letter recognition and motor practice. 77. Most toddlers can identify basic farm and zoo animals. Take this learning a step ahead with this Animal Habitat Activity using sensory bins, as shown in Pinay Homeschooler. 78. Help your little one learn about different fruits and vegetables and how each one is important for his health. This Farmer’s Market Busy Bag Activity from Mother’s Niche is perfect for it! 79. Your child can identify a shape on sight, but what about touch? This Shapes Hunt Sensory Activity from Fun with Mama encourages kids to dig for shapes and identify them by feeling the edges and corners. Fun! 80. We love Mr. Potato Head, and he’s returning the favor by helping out in this 5 Senses Potato Head Game from A Little Pinch of Perfect! Younger kids can focus on learning the body parts, while older ones can associate them with their senses. 81. Fishing is generally considered relaxing, but this Net Fishing Fine Motor Play for toddlers is sure to be more exciting! Best Toys 4 Toddlers shows us how to get the set up ready for this activity. 82. Little kids are natural explorers, so make use of this trait with a Nature Scavenger Hunt! Life with my Littles has a free printable that can be used to get out and hunt! 83. This is a great activity even for the littlest ones! Stick contact paper outside your house and let them roam and collect stuff to stick on their Sticky Wall! More details at Busy Toddler. 84. The best thing about playing outdoors is you can let things slip, fall and melt! Let your kids have fun with an Ice Boat Race, complete with tracks, as shown in Toddler Approved! 85. Let your toddler get jumping around with a Color Hop! Learn Play Imagine shows how you can use sidewalk chalk to create a custom hopping ground for your jumper! 86. Okay, now this activity is one meant for the outdoors! The Muddy Trucks and Car Wash activity requires two setups – one for the trucks to slosh around in the mud and another to get cleaned off! 87. This is not your average painting; you can use your feet too! New Young Mum sets up a delightful Cardboard Painting area in the garden for some free form art! 88. Outdoors means plants and gardening, and even toddlers or preschoolers can do it! Set up a Growing Tuff spot as shown in Adventures and Play, with all kinds of seeds and gardening implements and let your little one play gardener! 89. Create your own custom course with sidewalk chalk – to walk on a line, or hop on paws! The Pinterested Parent has a couple of Sidewalk Chalk Games for you to try with your toddler! 90. Blowing Bubbles is one of the most popular innocent charms of childhood, so why not make it large? Happy Hooligans has the recipe for a huge Homemade Giant Bubble that’ll knock the socks off other regular-sized bubbles! 91. Toddlers and preschoolers will have a lot of fun rolling out their play dough with these Spring Play dough Mat Printables. 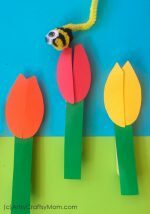 Make colorful flowers and butterflies, perfect for spring! 92. We love this set of Board Book Printables from Tot Schooling! It includes lots of printing and matching activities that are related to 16 of the most popular board books around the world. 93. This Lego Printable from Fun at Home with the Kids is great not just for travel, but for playing with at home as well! 94. Give your toddler or preschooler a place to go vroom vroom with his cars with these Printable Roads from Picklebums. Add blocks and train tracks for your very own city layout! 95. These Dot Marker Pages from Simple Fun for Kids are ideal for writing beginners. Following the dots helps children form the letters and have fun coloring them on the way! 96. Everyone loves a good matching game, and we particularly love this Silhouette Matching Set from The Connection We Share! The pictures are bright and colorful without being confusing, making them perfect for this age group! 97. Want to give those little fingers something a little more challenging to do? Try these Vegetable Lacing Cards from Busy Little Bugs, which are simple enough for the little ones to try. 98. Let your little toddler or preschool help these poor animals find their heads and tails! Itsy Bitsy Fun has this easy Printable Animal Puzzle featuring multiple animals who’ve got mixed up! 99. How do you teach little kids about eating healthy and including all food groups? Well, Food Groups Sorting Activity from Tot Schooling should help! 100. This Robots Shape Matching Puzzle from Tot Schooling is simple, yet challenging enough for the young kids. The resulting robots are cute too! So what do you think – which of these crafts and activities for toddlers and preschoolers will you be doing this week? Do let us know how it turned out for you! 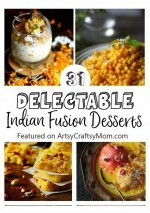 31 Delectable Indian Fusion Desserts for the festive season! Thanks for sharing my toddler nature scavenger hunt! 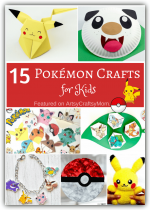 This is a fab list of different crafts for little ones. Thank you for including my cloud and rainbow craft in your list.